It’s not even all that hot, and I’m not used to it. I had forgotten how unpleasant it is to drive home from a friend’s barbeque with your back glued to the car seat. Or when your hands are sweaty and sticky between the fingers so it feels like you ought to wash your hands before you type. But it’s great weather for flowers. 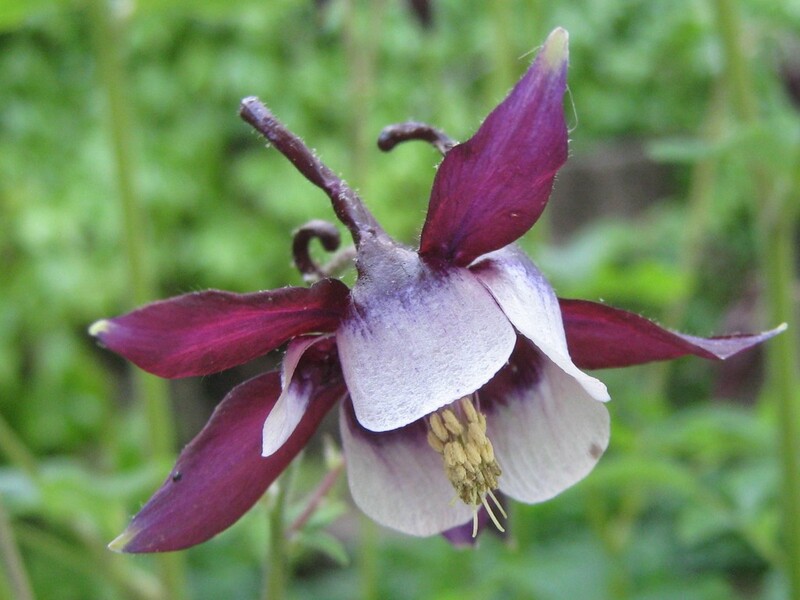 My “Magpie” columbine still think it’s spring, the perfect time to open purple and white clouds for the bees. And it’s great weather for sitting outside in the evening, feeling the breeze coming down the hill, smelling the lilac in full flower, and listen to the robins sing. It’s even nicer when the sweet cat follows you around and plops at your side to be petted while you watch a trail of tiny black ants carry tinier mysterious bits of white to their nest. Things get a little weird when she decides to roll around on your stinky bare feet, and weirder yet when she delivers to your toes a gentle kitty chomp. That’s just her way of letting you know that cats are mysterious creatures. No way can you blame that on the heat.